A month ago we went to Legoland California and coming home from the trip threw our Lego area into a whirlwind of activity…. 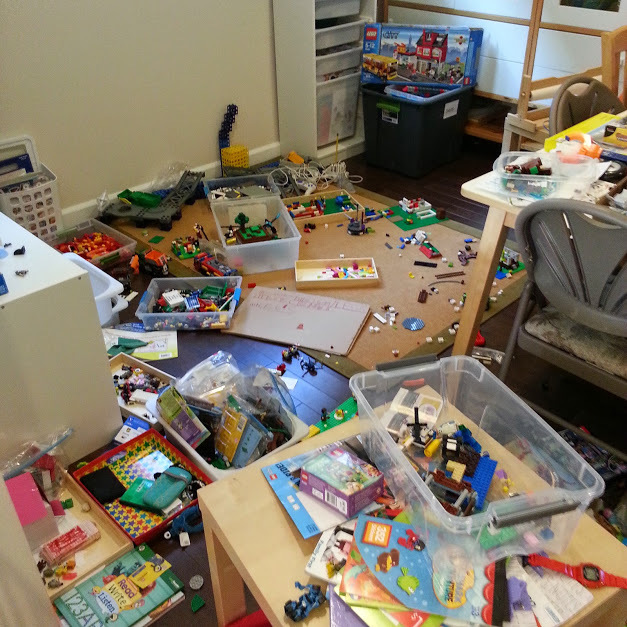 which meant after a week of playing our dining room / Lego area looked like this. until our dining room was spotless. 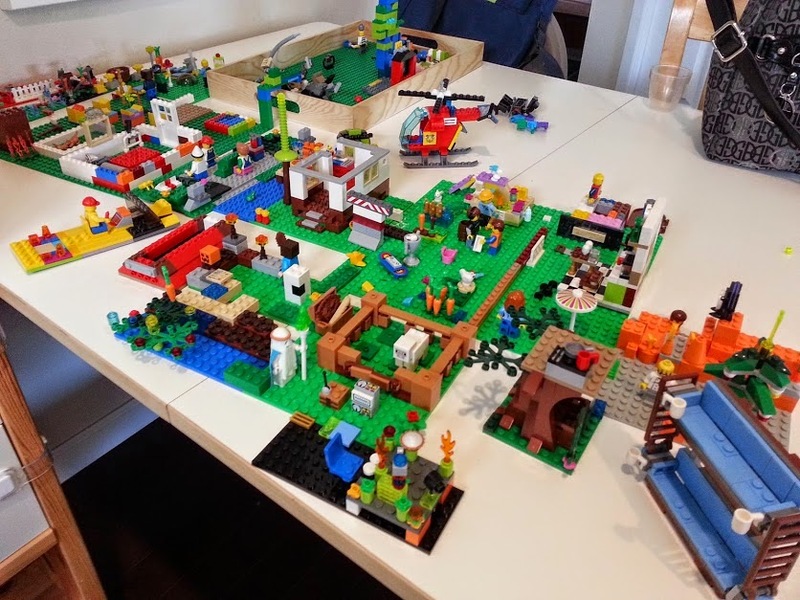 Since it’s behind a gate and it keeps sister’s little hands out of reach; we still use our dining room for Lego play. But now we have a system that’s working for quicker clean up. By the recommendation of a friend we laid down a bed sheet for the work surface and then moved their Lego back into the area. Open trays hold their bricks sorted by color groups as well as a tray for minifigures, one for specialty pieces and an empty tub for dumping Lego that need to be sorted. 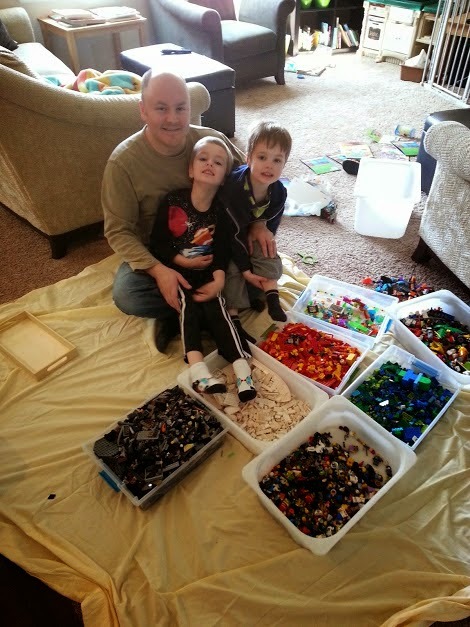 All the tubs can easily be put away in our IKEA storage unit and then the corners of the sheet are gathered up and loose Lego are dumped into an empty tub for sorting. 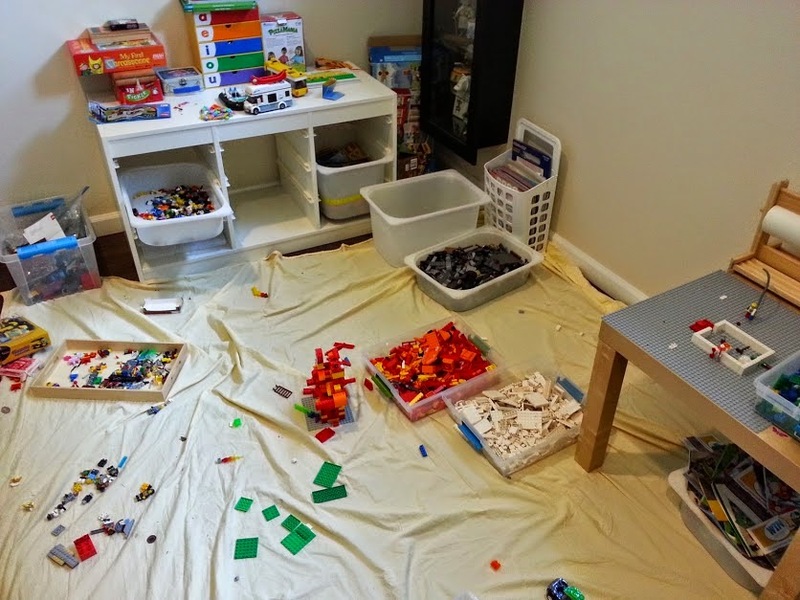 Now the boys can have their dedicated Lego work area but we have a solution for quick clean up for weekly maintenance or when we want to have a dinner party. Instruction booklets are saved and stored in a tub, we haven’t needed a better storage solution for those … yet. 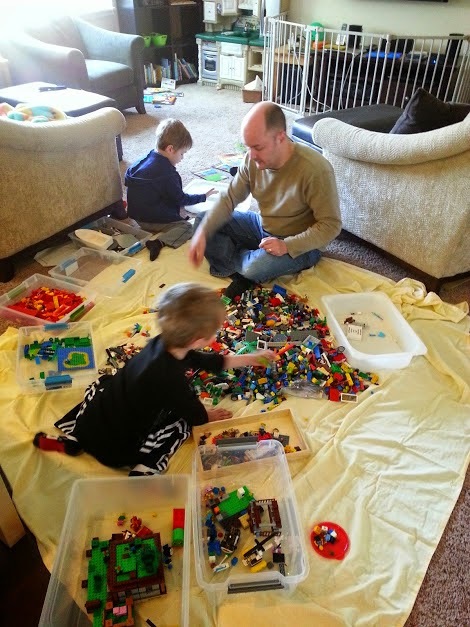 Our next project is to make our IKEA Lack side tables into Lego baseplate tables. 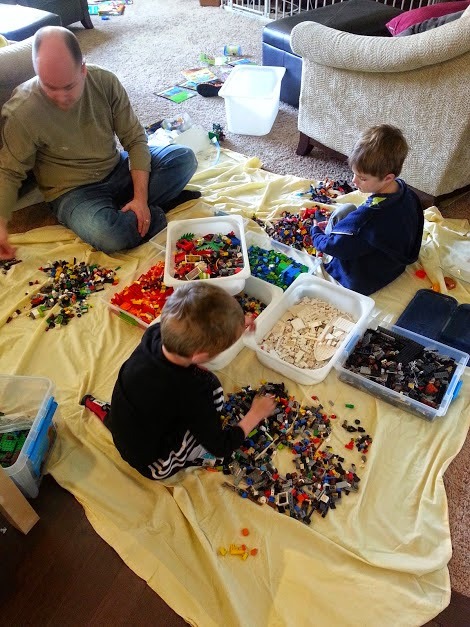 Previously the boys have just built kits by the instructions or done build and break but lately they’ve been wanting to keep things built for days on end. 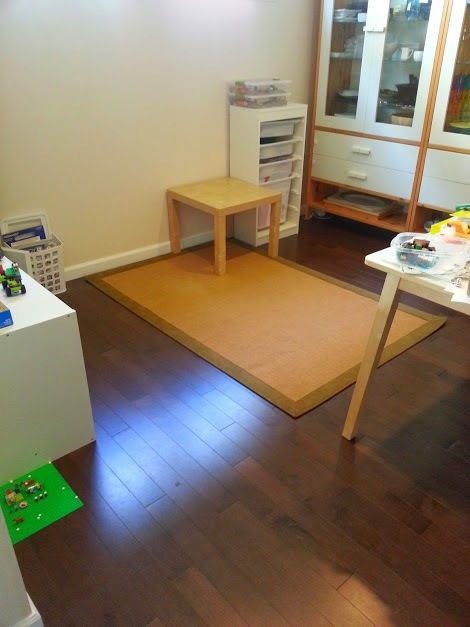 Keeping everything intact makes for tricky clean up sweeps so I think giving each boy their own table to build how they want will solve the next phase in their Lego lives. We also have wooden trays for corralling pieces while building kits, carrying pieces around the house or taking things to the grandparents’ houses. We bought extra base plates and glued plates into one of the trays (I keep meaning to do another). I also found that Sterillite boxes work well for storage since they have lids and can be stacked. 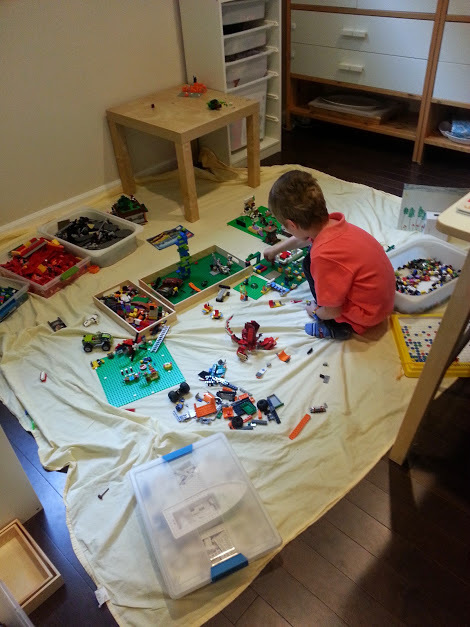 But mostly our Lego area stays out in the open until it’s time for clean up. I previously purchased a pack of the boxes on Amazon when I needed something for daily quiet boxes for the boys. It’s nice to find a new life for them. I’ve found over the last year and a half that our Lego play has changed and our storage needs have evolved right along with it.